This classic study by Dr. Cherniss from Rutgers University effectively builds the case for creating emotional intelligence enhancing leadership development programs and sponsoring one-on-one executive coaching engagements to build the critical emotional intelligence competencies necessary for management success. The following 19 points build a case for how emotional intelligence contributes to the bottom line in any work organization. Based on data from a variety of sources, it can be a valuable tool for HR practitioners and managers who need to make the case in their own organizations. Privacy: we do not release contact information. Experienced partners in a multinational consulting firm were assessed on the EI competencies plus three others. Partners who scored above the median on 9 or more of the 20 competencies delivered $1.2 million more profit from their accounts than did other partners—a 139 percent incremental gain (Boyatzis, 1999). An analysis of more than 300 top-level executives from fifteen global companies showed that six emotional competencies distinguished stars from the average: Influence, Team Leadership, Organizational Awareness, self-confidence, Achievement Drive, and Leadership (Spencer, L. M., Jr., 1997). At L'Oreal, sales agents selected on the basis of certain emotional competencies significantly outsold salespeople selected using the company's old selection procedure. On an annual basis, salespeople selected on the basis of emotional competence sold $91,370 more than other salespeople did, for a net revenue increase of $2,558,360. Salespeople selected on the basis of emotional competence also had 63% less turnover during the first year than those selected in the typical way (Spencer & Spencer, 1993; Spencer, McClelland, & Kelner, 1997). In a national insurance company, insurance sales agents who were weak in emotional competencies such as self-confidence, initiative, and empathy sold policies with an average premium of $54,000. Those who were very strong in at least 5 of 8 key emotional competencies sold policies worth $114,000 (Hay/McBer Research and Innovation Group, 1997). In a large beverage firm, using standard methods to hire division presidents, 50% left within two years, mostly because of poor performance. When they started selecting based on emotional competencies such as initiative, self-confidence, and leadership, only 6% left in two years. Furthermore, the executives selected based on emotional competence were far more likely to perform in the top third based on salary bonuses for performance of the divisions they led: 87% were in the top third. In addition, division leaders with these competencies outperformed their targets by 15 to 20 percent. Those who lacked them under-performed by almost 20% (McClelland, 1999). Research by the Center for Creative Leadership has found that the primary causes of derailment in executives involve deficits in emotional competence. The three primary ones are difficulty in handling change, not being able to work well in a team, and poor interpersonal relations. After supervisors in a manufacturing plant received training in emotional competencies such as how to listen better and help employees resolve problems on their own, lost-time accidents were reduced by 50 percent, formal grievances were reduced from an average of 15 per year to 3 per year, and the plant exceeded productivity goals by $250,000 (Pesuric & Byham, 1996). In another manufacturing plant where supervisors received similar training, production increased 17 percent. There was no such increase in production for a group of matched supervisors who were not trained (Porras & Anderson, 1981). One of the foundations of emotional competence -- accurate self-assessment -- was associated with superior performance among several hundred managers from 12 different organizations (Boyatzis, 1982). Another emotional competence, the ability to handle stress, was linked to success as a store manager in a retail chain. The most successful store managers were those best able to handle stress. Success was based on net profits, sales per square foot, sales per employee, and per dollar inventory investment (Lusch & Serpkeuci, 1990). Optimism is another emotional competence that leads to increased productivity. New salesmen at Met Life who scored high on a test of "learned optimism" sold 37 percent more life insurance in their first two years than pessimists (Seligman, 1990). A study of 130 executives found that how well people handled their own emotions determined how much people around them preferred to deal with them (Walter V. Clarke Associates, 1997). For sales reps at a computer company, those hired based on their emotional competence were 90% more likely to finish their training than those hired on other criteria (Hay/McBer Research and Innovation Group, 1997). At a national furniture retailer, sales people hired based on emotional competence had half the dropout rate during their first year (Hay/McBer Research and Innovation Group, 1997). 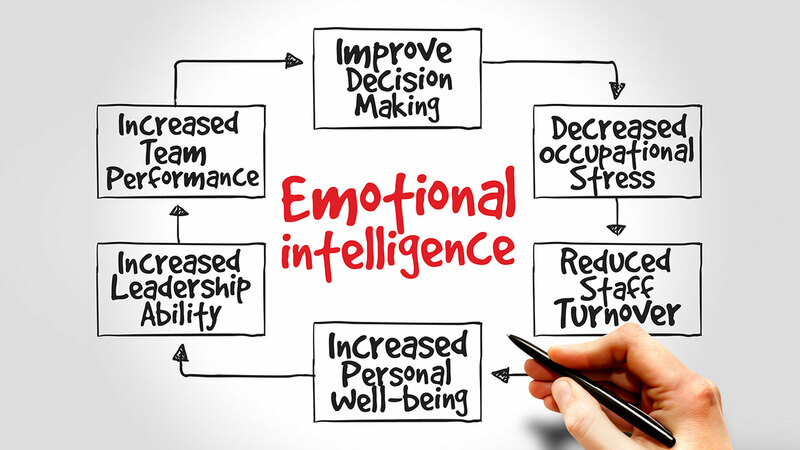 For 515 senior executives analyzed by the search firm Egon Zehnder International, those who were primarily strong in emotional intelligence were more likely to succeed than those who were strongest in either relevant previous experience or IQ. In other words, emotional intelligence was a better predictor of success than either relevant previous experience or high IQ. More specifically, the executive was high in emotional intelligence in 74 percent of the successes and only in 24 percent of the failures. The study included executives in Latin America, Germany, and Japan, and the results were almost identical in all three cultures. The following description of a "star" performer reveals how several emotional competencies (noted in italics) were critical in his success: Michael Iem worked at Tandem Computers. Shortly after joining the company as a junior staff analyst, he became aware of the market trend away from mainframe computers to networks that linked workstations and personal computers (Service Orientation). Iem realized that unless Tandem responded to the trend, its products would become obsolete (Initiative and Innovation). He had to convince Tandem's managers that their old emphasis on mainframes was no longer appropriate (Influence) and then develop a system using new technology (Leadership, Change Catalyst). He spent four years showing off his new system to customers and company sales personnel before the new network applications were fully accepted (Self-confidence, Self-Control, Achievement Drive) (from Richman, L. S., "How to get ahead in America," Fortune, May 16, 1994, pp. 46-54). Financial advisors at American Express whose managers completed the Emotional Competence training program were compared to an equal number whose managers had not. During the year following training, the advisors of trained managers grew their businesses by 18.1% compared to 16.2% for those whose managers were untrained. The most successful debt collectors in a large collection agency had an average goal attainment of 163 percent over a three-month period. They were compared with a group of collectors who achieved an average of only 80 percent over the same time period. The most successful collectors scored significantly higher in the emotional intelligence competencies of self-actualization, independence, and optimism. (Self-actualization refers to a well-developed, inner knowledge of one's own goals and a sense of pride in one's work.) (Bachman et al., 2000). Bachman, J., Stein, S., Campbell, K., & Sitarenios, G. (2000). Emotional intelligence in the collection of debt. International Journal of Selection and Assessment, 8(3), 176-182. Boyatzis, R. E. (1999). From a presentation to the Linkage Conference on Emotional Intelligence, Chicago, IL, September 27, 1999. Boyatzis, R. (1982). The competent manager: A model for effective performance. New York: John Wiley and Sons. Goleman, D. (1998). Working with emotional intelligence. New York: Bantam. Hay/McBer Research and Innovation Group (1997). This research was provided to Daniel Goleman and is reported in his book (Goleman, 1998). Hunter, J. E., Schmidt, F. L., & Judiesch, M. K. (1990). Individual Differences in Output Variability as a Function of Job Complexity. Journal of Applied Psychology, 75, 28-42. Lusch, R. F., & Serpkeuci, R. (1990). Personal differences, job tension, job outcomes, and store performance: A study of retail managers. Journal of Marketing. McClelland, D. C. (1999). Identifying competencies with behavioral-event interviews. Psychological Science, 9(5), 331-339. Pesuric, A., & Byham, W. (1996, July). The new look in behavior modeling. Training and Development, 25-33. Porras, J. I., & Anderson, B. (1981). Improving managerial effectiveness through modeling-based training. Organizational Dynamics, 9, 60-77. Richman, L. S. (1994, May 16). How to get ahead in America. Fortune, 46-54. Seligman, M. E. P. (1990). Learned optimism. New York: Knopf. Spencer, L. M., Jr. , & Spencer, S. (1993). Competence at work: Models for superior performance. New York: John Wiley and Sons. Spencer, L. M. J., McClelland, D. C., & Kelner, S. (1997). Competency assessment methods: History and state of the art. Boston: Hay/McBer. Walter V. Clarke Associates. (1996). Activity vector analysis: Some applications to the concept of emotional intelligence. Pittsburgh, PA: Walter V. Clarke Associates.